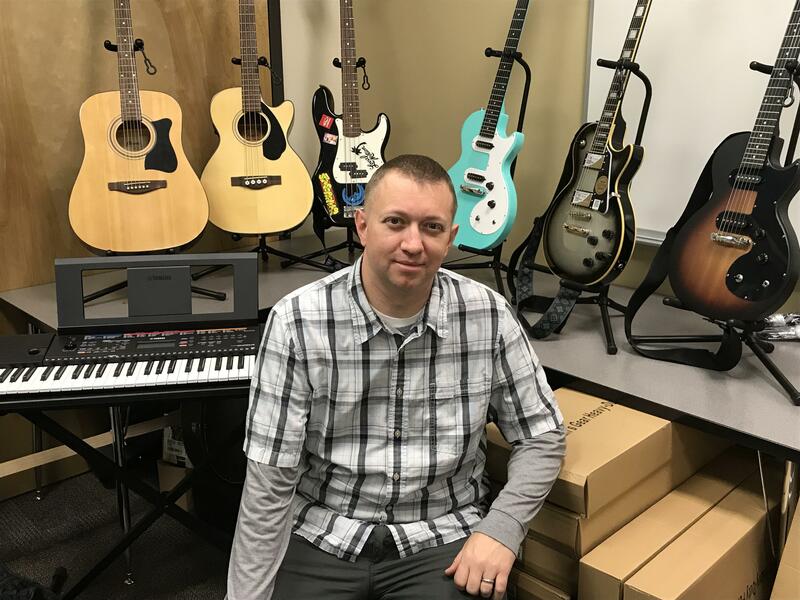 Jason Abrams teaches English and journalism at Dishman Hills High School in Spokane Valley but will soon get his chance to be a music teacher thanks to a nearly $5,000 grant from the Hagan Foundation. The alternative high school in the West Valley School District hasn’t had a music program in years, Abrams said. The school is the oldest nontraditional high school in the area and features small classes of fewer than a dozen students. Though Abrams has not previously been a music teacher, he has a lengthy background in music. His dad played guitar and his mother sang. Abrams studied music from the fifth grade until his junior year in college. “My experience with music is that learning music activates a part of the brain that carries over really well into other parts of education,” he said. Abrams had the idea to start up a music program at Dishman Hills and started looking for funding. He was able to raise $1,800 from Donors Choose, a sort of GoFundMe site for educators. He bought basic supplies as well as a couple of acoustic guitars and banjos. Then he found the Hagan Foundation. The foundation is named after Dr. Cornelius Hagan, a Spokane ear, nose and throat specialist. He practiced medicine for Spokane for more than three decades. He established the Hagan Foundation to support educational initiatives in 1997. He requested nearly $5,000. “When I wrote the grant, I had a very specific budget request,” he said. However, after he was awarded the grant, he learned that the company he planned to buy instruments from had stopped making the items he wanted. The Hagan Foundation gave him permission to shop freely and Abrams decided to purchase electric guitars rather than acoustic because they are easier for beginners. He purchased 12 electric guitars, three basses and four banjos along with music stands, method books, tuners and amplifiers. He said he’s looking forward to being able to offer music to his students. “This is the first time we’ve had music in a while,” he said. Dishman Hills High School is focused on core classes, but after each of the four quarters students can sign up for electives during Experience Week. Each elective meets for three hours a day. Abrams is planning his first music class during the Experience Week at the end of this month. All of the newly purchased instruments are on display in his classroom and they have attracted the interest of students, leading to a surge of interest. “I know we’ve had more request the class than we can accommodate in one week,” he said. He has high hopes for the school’s new music program going forward. “We’re constantly developing things here,” he said. Published: Jan. 24, 2019, 5 a.m.